However, VMware actually released an additional product last week which snuck under the radar, vibddi. I actually wrote about this unsupported and undocumented utility last year: How to inject custom drivers into an ESXi 4.1 image using vibddi? vibddi (pronounced vib d-d-i) stands for VIB (vSphere Installation Bundle) Disk Dump Image and it is a utility to help users easily customize ESXi images with custom drivers. This utility first appeared in the vSphere Auto Deploy appliance and it looks like VMware has finally released it as an official tool to support vSphere 4.1 image customization. You also may have heard about the new Image Builder tool with the release of vSphere 5, the origins of that utility actually came from vibddi. If you are still using vSphere 4.1 and need to inject or modify drivers, I would highly recommend you take a look at the tool as it is extremely simple to use. For more details, please check out the new VMware KB article 2003316 documenting the details of the utility or my blog post. 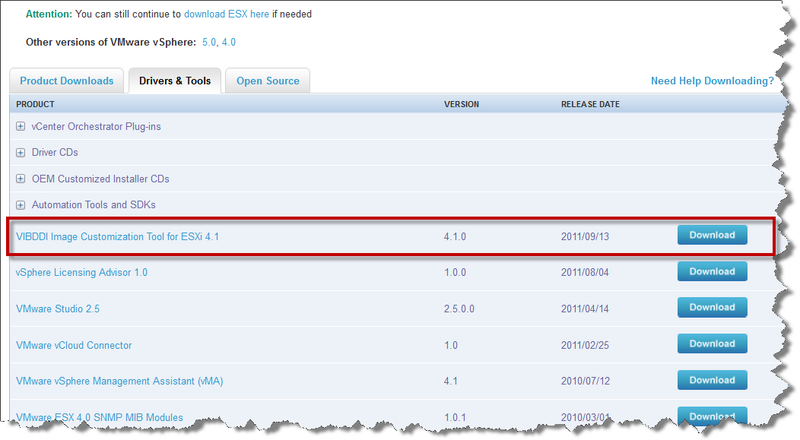 If you are using vSphere 5, you will need to use Image Builder as vSphere 4.1 is not supported and vice-a-versa with ESXi 5 with vibddi. Note: There are some changes in the latest vibddi utility compared to the one found in the vSphere Auto Deploy such as injecting custom kickstart configuration file or license file. If you rely on these features, you may want to use the older version or manually update these after the system build.